The growth of the outsourcing industry in the Philippines is nothing short of being called as phenomenal. From being absolutely nothing just a few years ago to employing over a million Filipinos now, the call center industry has certainly seen a massive and exponential growth in this city. With an annual growth rate of about 20%, the BPO industry in Philippines is on a constant rise, witnessing an increase in the number of call centers and employees. The rise of Manila city, the capital city of Philippines, in the BPO sector has been the pillar of strength and is responsible for the overall rise of this Southeast Asian country. The revenue from outsourcing has shot up from mere $9 billion in 2010 and is now expected to reach a staggering $55 billion by the year 2020. The American colonization in Philippines in the past has left its impact on the language and culture of this nation, making it easier for the Filipinos to easily cope up with the call center culture. What Makes Manila Follow India's Outsourcing Success Story? The average age of the Filipino population is about 24 years, with most of them being fresh college graduates. This age group is highly favorable, as these professionals are the most productive, look forward to work hard, and give their best. Besides, most of the youngsters here have grown up with the western languages and cultures. This makes them an ideal choice for providing voice-based services, increasing the chances of call center industry to flourish here. The government of Philippines has been highly supportive when it comes to investing in better infrastructure and skill development. Besides, the government here has also played a key role in implementing policies and regulations, which favor the growth of the BPO industry. The American presence for a long time in this Southeast Asian country has made the Filipinos acquire fluent western English. This fluency in English and an understanding of the western culture help the call center agents here to easily understand and cater to the business needs of these nations most efficiently. This has been one of the most important factors for the BPO culture to flourish in this part of the world. Initially, the main focus of global companies was to choose BPO and call center outsourcing to Manila and the rest of the services to India. But this is changing over time and Philippines are now going towards providing non-voice based services in addition to quality voice-based services. Some of the other major services which have picked up include graphic design outsourcing and data entry outsourcing to Manila. 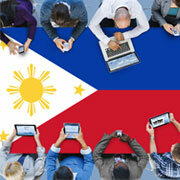 Outsourcing to Manila - What Does the Future Hold? Philippines have emerged as one of the leading outsourcing destinations over the past few years after India and China in the lead. The gap between the leaders and Manila has certainly reduced, but it is going to take some time for that gap to narrow down further. However, with the help of stable infrastructure, skilled and young workforce, support from the government, and similarities with the western culture, the outsourcing industry in Philippines has boomed. Since 2004, Philippines has tripled its BPO's global market share, from mere 4% in 2004 to 12.3% in 2014, which is now estimated to reach a staggering 19% by 2020! With an aggressive growth in the BPO sector in 2017, this nation is expected to reach BPO revenue target of $25.5 billion, with 1.4 million Filipinos employed by the end of 2017, projected to reach $66.7 billion by 2022. Filipinos are not only fluent with the American English and have better communication skills, but they are also more patient and calm when compared to their Indian counterparts. This is the key to successfully handle angry customers on the other side of the phone. Looking at these factors it is certain that Manila will soon top the list, but how soon that will happen is debatable. Overtaking Indian BPO industry in terms of quality of services provided, particularly technology-based services, will prove to be difficult. Outsource2india has been a leading outsourcing service provider based in India with delivery centers spread across the globe, including Philippines and India. Our multi-domain industry experience of over 20 years in the BPO sector has equipped us to precisely understand the outsourcing needs of global clients and cater to it. Having service centers across Philippines, we can help you to quickly migrate your operations to Manila through our hassle-free transition process. By choosing us, you can get access to state-of-the-art infrastructure, stringent data security, skilled resources, and quick turnaround time at highly cost-effective rates. Get in touch with us today to outsource your business requirements to Philippines and drastically reduce your operational costs, without any compromise on the quality.